Route 123 in Northern Virginia marks the watershed divide at the western edge of the Fairfax campus. The road is located on the ridgetop between the Pohick Creek watershed on the east and the Popes Head Run watershed on the west. Rain that falls on the athletic fields west of Route 123 runs down Pope's Head Creek, through the town of Clifton, into Bull Run - just upstream from the Hemlock Overlook outdoor education center. That same rainwater will flow down Bull Run, through Occoquan Reservoir into the Potomac River, and then down to the Chesapeake Bay. When the tides and currents slosh water from the Chesapeake Bay further east past Cape Henry/Cape Charles near Norfolk, the rainfall from the Fairfax Campus will finally reach the Atlantic Ocean. On the east side of Route 123, rain that falls on the parking lots near the academic buildings and the statue of George Mason in front of the George Johnson Center will never flow past Clifton, or through the Occoquan reservoir. Instead, rain that falls on the Fairfax Campus east of 123 will run downhill through ditches and stormwater pipes, into the pond in front of Center for the Arts building, and then underneath Braddock Road. The runoff from the headwaters of the watershed will flow together to form Rabbit Branch. That stream will join with Sideburn Branch to form Pohick Creek. Pohick Creek will flow past the agricultural fields of the old Lorton prison (now converted into "Laurel Hills") and empty into Pohick Bay, finally joining the Potomac River just north of Mason Neck. Runoff from the original campus of George Mason University drops about 500 feet in its journey before reaching sea level at the Potomac River where it flows past Gunston Hall, the home of George Mason himself. All three GMU campuses are the Atlantic Ocean watershed, because the rainwater that falls on all three campuses will drain into the Atlantic Ocean. The newest GMU campus, in Loudoun County, is in the Potomac River watershed. For that matter, Shenandoah University in Winchester, James Madison University in Harrisonburg, Bridgewater College in Bridgewater, and Mary Baldwin in Staunton are also in the Potomac River watershed. 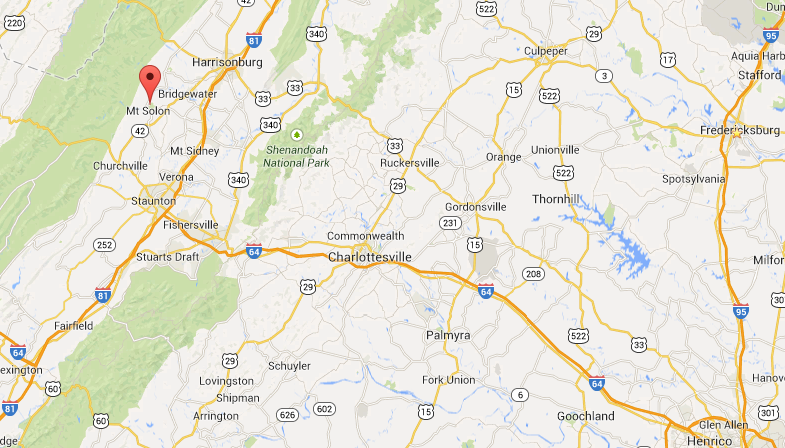 The University of Virginia (UVA) in Charlottesville is NOT in the Potomac River watershed. Rain that falls on the "grounds" of that university never flows into the Potomac River. Runoff from the "grounds" at UVA flows into the Rivanna River, which is a tributary to the James River. Ultimately, runoff from Mr. Jefferson's university will reach the Chesapeake Bay, but that runoff never flows into the Potomac River. Runoff from the University of Mary Washington in Fredericksburg flows into the Rappahannock River, and reaches the Chesapeake Bay without ever getting into the Potomac River. To get to the Potomac River, a raindrop landing in downtown Fredericksburg would have to flow to the mouth of the Rappahannock, enter the Chesapeake Bay, then be carried by tides and currents north into the Potomac River. 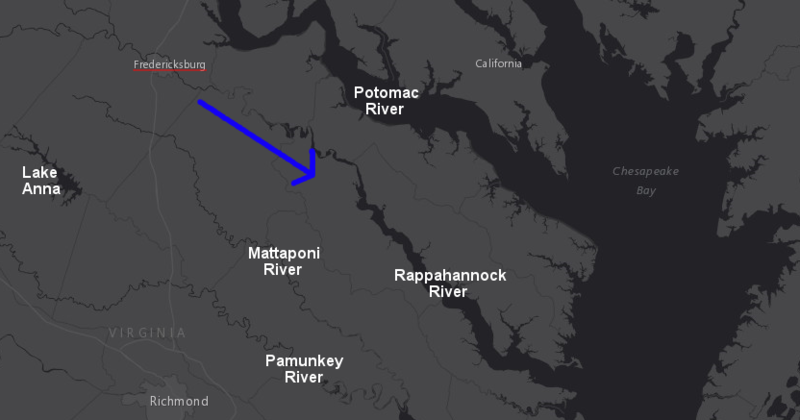 It is theoretically possible for a raindrop to make that journey, but by definition the Rappahannock River ends when it reaches the Chesapeake Bay. The Rappahannock River and the Potomac River are completely separate tributaries draining into the bay. Do you think Washington and Lee University or the Virginia Military Institute (VMI), both in Lexington on I-81, are in the Potomac River watershed? Are they in the Chesapeake Bay watershed? What about Virginia Commonwealth University (VCU), located in Richmond? 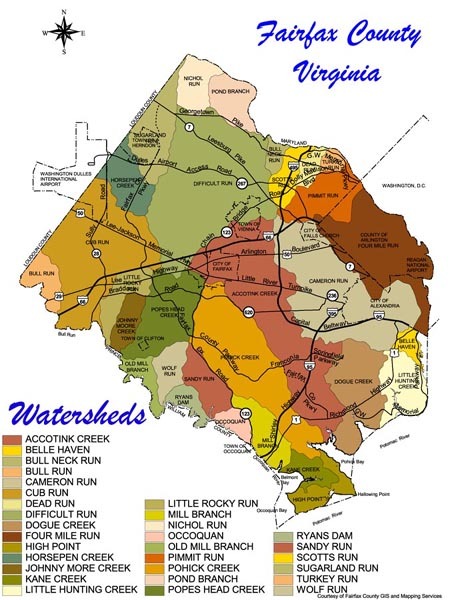 Virginia Tech and Radford University are NOT in the Chesapeake Bay watershed. Those campuses is in the Gulf of Mexico watershed, on the other side of the Eastern Continental Divide from GMU. Radford is on the other side of the Eastern Continental Divide from the Chesapeake Bay. Rainwater that falls on the home of the Hokies will drain into the New River and flow west, ending up in the Mississippi River and drifting past New Orleans on the way to the Gulf of Mexico. The Radford Arsenal is one of the largest sources of nitrogen polution in Virginia, but no matter how much is invested to reduce pollution there... the New River does not drain into the Chesapeake Bay, so pollution cleanup at the arsenal will not help to "Save the Bay." is the park with Natural Chimneys in the Potomac River watershed? There are three major continental divides in the United States. The Western Continental Divide in the Rocky Mountains is the most famous one. If you go west on Interstate 70 through Colorado, you will cross the "other" Continental Divide near Aspen, on your way to San Francisco. 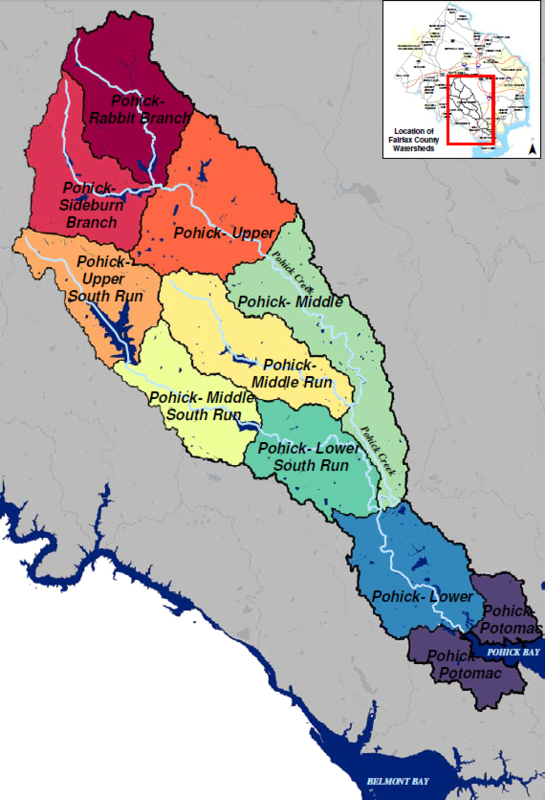 Rainwater that falls on the ski slopes at Aspen, on the wheat fields of western Washington state, or on the gold dome of the state capitol of California at Sacramento will flow west into the Pacific Ocean; those places are in the Pacific Ocean watershed. Also, there is an Arctic Continental Divide in Alaska, where the Brooks Range is the watershed divide that directs water to either the Pacific or Arctic oceans. The Fairfax Campus is split between the Popes Head Creek and Pohick Creek watersheds. On the west side of Route 123 with the athletic fields, raindrops landing on the campus drain into Popes Head Creek, which flows into the Occoquan Reservoir. The reservoir is an artificial lake created by a dam across the Occoquan River, so Popes Head Creek is a tributary of the Occoquan River as well as being a tributary of the Potomac River. 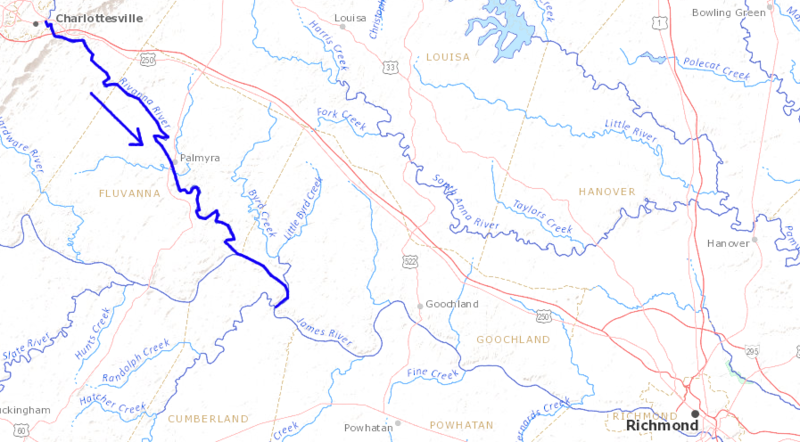 In contrast, Pohick Creek is a tributary of the Potomac River but is not in the Ocoquan watershed. Rain falling in the Pohick Creek watershed will flow into Pohick Creek, then go downhill to the Potomac River and on to the Chesapeake Bay. The water in Pohick Creek never flows into the Occoquan Reservoir. Water reaching Pohick Creek does not defy gravity to flow uphill from the Potomac River and across the dam forming the reservoir, upstream from the Town of Occoquan near I-95. The 2005 Fairfax County Stream Physical Assessment (2005 SPA) found that nearly 75 percent of the stream channels in Pohick Creek watershed show signs of heavy erosion. This erosion has caused, steep banks, bank failures, channel widening and deepening. The Pohick dams were planned for a design life of 100 years. At that time, without ongoing sediment removal efforts, all of the water in the lake would be replaced by sediment. The Arlington Campus of GMU is on the divide between Spot Run and Four Mile Run. At the scale of the DeLorme Atlas and Gazetteer, the orange coloring to indicate dense urban development obscures the location of the streams... and on the ground, the pavement and stormsewers obscure the actual flow of the water. However, a quick glance at the map will indicate that water from the Arlinton Campus does not flow into the Occoquan River. GMU has used a number of Virginia geographic names to identify streets and dormitories. 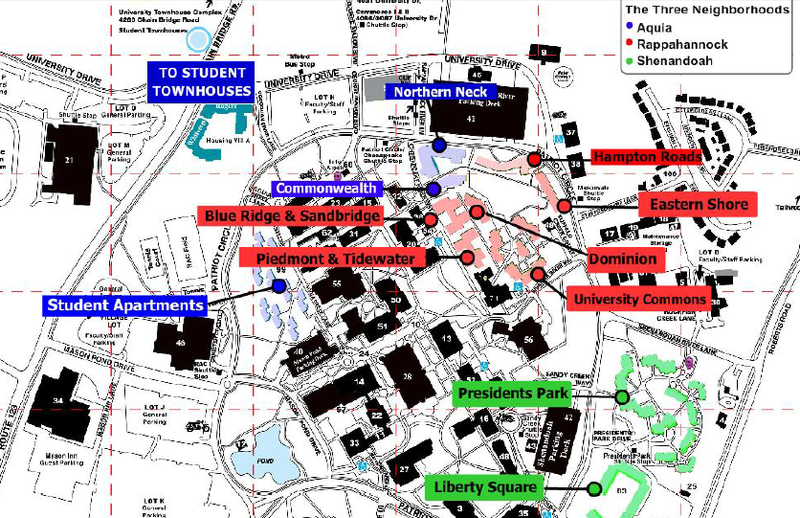 When housing officials designated three neighborhoods for on-campus dorms, however, the relationships of those dorms with Virginia watersheds was not considered. 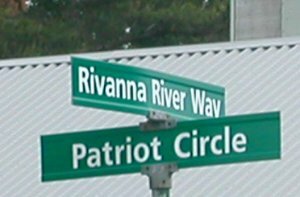 For example, places named after the Eastern Shore and Hampton Roads were lumped together in the Rappahannock neighborhood.